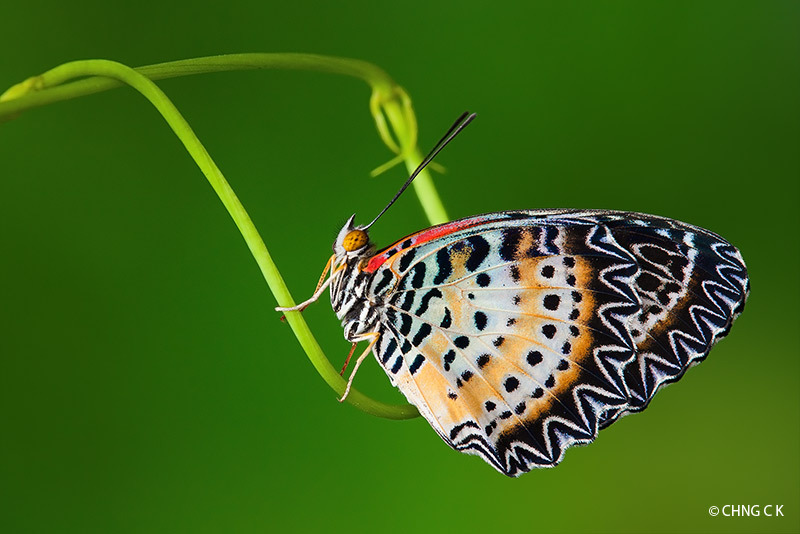 We feature another immigrant species this week - the Leopard Lacewing (Cethosia cyane). This species was not present in the checklists of the early researchers and appeared in the Malaysian/Singaporean territory some time in the late 90's and early 2000's. It is common in Singapore today, and is quite widespread across various habitats. Its preferred host plant, Passiflora foetida, is a secondary forest "weed", and grows very quickly. This shot of a pristine female Leopard Lacewing was taken last weekend by ButterflyCircle member Chng CK. In the field, the brighter coloured males tend to outnumber females.